A while ago, I posted an update on my Facebook page asking if anyone wanted to go ghost hunting with me. I was surprised by how many people responded that they’d like to come along! So I contacted Kelley Freese, the owner of the Palmer House Hotel in Sauk Centre, MN and asked if she’d mind if a local paranormal YA author (me, in case you were confused) spent an evening investigating her haunted hotel with a group of curious and brave friends. Kelley happily set up a date for our investigation and reserved the most haunted rooms for us to spend the night in. With less than one week between us and an overnight slumber party with some restless spirits, my team of investigators had our first pre-investigation meeting this afternoon. My first thought was, what should a good hostess serve at a paranormal investigating meeting?? I decided buffalo chicken dip with veggies and assorted cheese and crackers would do just fine – not that any of those things have anything at all to do with ghosts – it just happened to be what I had handy. 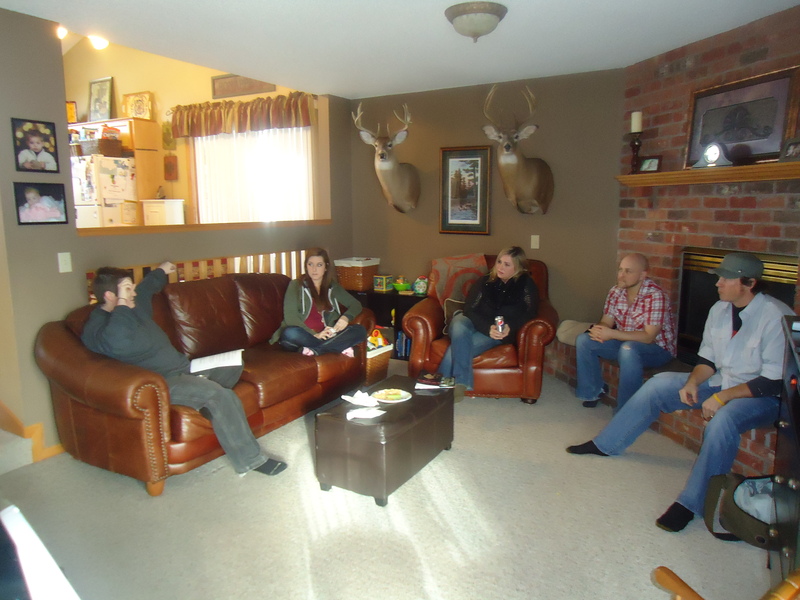 Part of the team, chillin’ in my living room – listening to our leader explain the best way to capture reliable evidence. Not everyone attending the investigation next weekend could make it today, but 7 out of 12 isn’t bad (we initially had 13 coming until my childhood best friend called from IA today and said she probably couldn’t make it to the investigation – I’ll miss her, but going into a ghost hunt with 13 people was kinda creepin’ me out). The group going is such an awesome mix of people. One is a mother/daughter duo who I just recently met at my daughter’s ballet studio. We’ll also have a mother/son team joining us (I worked with the mother years ago and have kept in touch with her through Facebook), a pair of brothers (one who is a very talented writer/illustrator friend of mine), another uber-amazing illustrator friend, my dear friend and her hubby, my own brave husband and our leader (a paranormal investigator with many years of professional experience). Some of the group I know pretty well – others I only know a little. Some know each other – others are meeting for the first time. But by the time we leave the Palmer House Hotel next Sunday, we’ll all be bonded in a unique way – the kind of bonding that only occurs when people sit around in the dark, speaking to the spirits of long departed folks while holding k2 meters, digital voice recorders and infrared video cameras. I’m beyond thrilled to have them all join me on my first group investigation! I’m also super-excited to be investigating this particular location which was featured on the Travel Channel’s Ghost Adventures this season. The link below will take you to the Palmer House Hotel website with links to video clips from the Ghost Adventures episode. They captured some pretty awesome EVPs. So Saturday night, while “normal” people are either getting ready for bed or maybe enjoying a night out at dinner and a movie, we’ll be sitting in a dark basement politely asking the ghosts to give us a sign of their presence. I pinky-promise to tell you ALL about our investigation and plan to share video/audio clips from the evening. I’ll also be interviewing Kelley Freese and will share with you her personal experiences and thoughts on owning one of the most haunted hotels in the midwest. Okay, so now it’s time for a contest!! If the group of people joining me on this investigation were to form a paranormal investigating group, what would be a cool name for us (think TAPS from Ghost Hunters). About half the group is either a writer/illustrator…so it might be fun to reference that in the name. And it needs to have a cool acronym. I’ll randomly draw a winner and send them a cool book as a prize! Ready…set…GO!! Heard about this at the dental office yesterday – I am so interested to hear how it goes for you at the Palmer House. Landon was telling me that he told you about our trip! 🙂 I’ll write all about it next week! It should be super-fun!! Oh, it’s gonna be a fun time, indeed!!! !